Mr. VO Sy Nhan is taking leader roles as a local professional developer as well as real estate fund manager. Prior to joining private sector, Nhan had worked for the Department of Planning and Investment of Ho Chi Minh City as a public servant. With passion and extensive experience, he was promoted to Head of the Investment & Promotion Team and Head of the O.D.A Project Management Team. After 8 long years of contributing to the city, Nhan returned to Private sector. Throughout the years, he successfully structured and executed deals for international quality real estate properties such as The Estella (a residential estate), Le Meridien Saigon Complex (5-star hotel and A class offices), OneHub Saigon (a mixed-use business park), South Rach Chiec Center, and Thu Thiem Empire City. The most recent highlight of his career was the acquisition of a Vietnam Real Estate Portfolio from Indochina Land, which includes Hyatt Regency Danang Resort & Spa, Indochina Plaza Hanoi and 2 other development projects in Danang and Ho Chi Minh City. Lastly, Nhan was co -founder and Chairman of Naked Hub Vietnam JV that later acquired by WeWork strategically. He is currently Co-Founder and Managing Principal of Gaw NP Industrial with US$ 200 million Investment Capital. 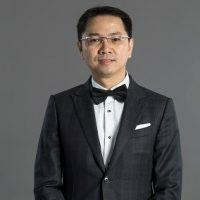 Utilizing his extensive knowledge and networks, Nhan has been cooperated and partners up with major foreign parties such as Keppel Land, Starwood, GAW Capital Partners, and Ascendas (Singapore). Nhan actively involves and manages the above projects at the executive management level and at the Board level. The projects are held in high regard by local government. He also invests and manages industrial estates and warehousing. Nhan graduated from Deakin University (Australia) in 1999 with a Bachelor of Commerce majoring in Economics and Marketing. He also earned an M.B.A. from Maastricht School of Management (The Netherland) in the field of Strategic Management in 2004. Nhan is married to Linh T.M. Nguyen and has been blessed with a daughter and a son. He is also an active member of YPO (Young President Organization). The Vietnam Boom - is it sustainable?